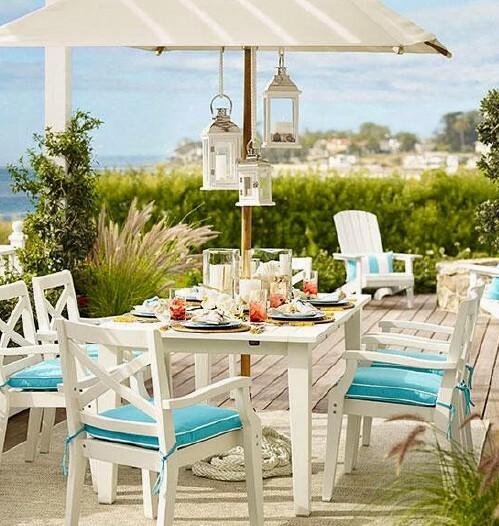 Dining “alfresco” – ahh…for me, just saying those words conjures up an image of an outdoor bistro or a lovely evening dinner party under the stars. I don’t know about you, but I find that almost anything just plain tastes better when eaten outdoors. Whether it’s simple fare, like hot dogs and hamburgers, or a gourmet meal, dining outside makes me feel like I’m on vacation, even on a weeknight. Being in Southern California means that we can enjoy fresh air and food together almost year-round, so creating an outdoor space at home to enjoy not only makes sense, but also expands your usable living space, and may even create more value for your home. Outdoor rooms or dining spaces can be created fairly easily, no matter your budget. Here are some things to consider to make the perfect little “get away from it all” in your own backyard. As with any home improvement project, it’s important to define your vision and budget before starting. How will you use the space? How many people do you need to seat on a regular basis? How about when you entertain? Do you tend to throw huge BBQ’s or more intimate dinner parties? Planning in advance of designing and purchasing will save you a lot of time and money in the long run. First, look at how much space you have or want to dedicate. Is there hardscape or decking, or will you need to install something to keep your table level? In addition to a table and chairs, you may want to consider an umbrella, or pergola for shade if you’ll be using your space during sunny days. Be sure to think about comfort during the different times of the day that you’ll be using the space, and select seating options that will be comfortable and lend to lingering. An easy way to define a dedicated space is by using an outdoor rug – there are many affordable options that are fun, however to truly marry your outdoor space with your house, you may want to stick with the same color scheme as your existing furnishings, or opt for colors that are complementary to what is immediately adjacent to your new space – doing this will help to create a cohesive design, and really bring the outdoors in. Now it’s time to think about your dishes, glasses, and linens – there’s no reason to relegate yourself to paper plates and plastic forks unless you’re entertaining a crowd. There are so many options for beautiful plastic or melamine plates that look like pottery, you may have a hard time choosing! It’s a good idea to stick with unbreakable items outside if you have kids, but there’s no reason you can’t.